Hello! I made this for today's Sketch Challenge on SCS. I love today's layout! I really can't seem to stop playing with these adorable Fhionas from Your Next Stamp! They are so cute and fun to color! This one is called Happy Halloween Fhiona. I stamped her with Memento Tuxedo Black, colored her with Copics, cut her out with Square Nestabilities, and while leaving the Nestie in place, I sponged around her with Old Olive ink. The dp is some I picked up last year at Joanns called the Debbie Mumm Harvest and Holiday Mat Pack. 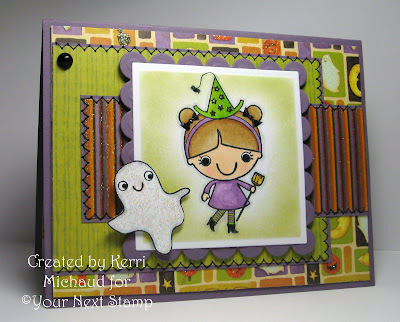 There are so many fun glittery papers in there : ) I added some Stardust Stickles to the little ghost, as well as to the stars on Fhiona's hat and bows. I also added some zigzag stitching and the black Kaiser Pearl in the corner. For the inside I cut a strip of the dp, added the goo border that I punched with a Martha Stewart Punch found at Michaels and added the sentiment and spider also from the Happy Halloween Fhiona set. I love it!!! I hope you do too, and thank you so much for stopping by! So adorable Kerri! Love the inside of the card too! The goo punch is perfect! I love it! So cute and spooky :) The inside is just as cool as the front!!! OH MY GOSH Kerri this is SOOOOO ADORABLE!!! TOO CUTE FOR WORDS!!! WOW!!!! Boo! So cute Kerri...love everything about it! Am hoping to get my SCS done tomorrow...yours is awesome girly! Kerri, this is so super cute and beautifully colored and detailed!!! Lovely card!!! Oh this card is fantastic. And I love that you finished the inside too - - I don't think I have done that but ONE time!! HUGS? - - you never say HUGS - - you're gettin' all lovey now.....what is that about? 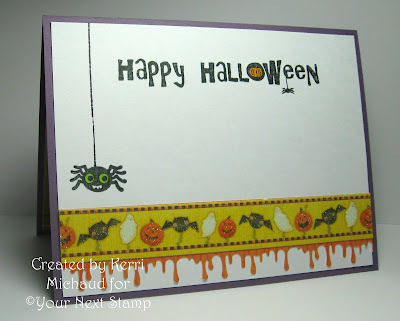 This is gorgeous Kerri, I'm not much into halloween cards - too spooky, but I love this it's so cute and fun - brilliant! Love it inside and out Kerri!! Oooooh! I think I 'need' this stamp! How CUTE is she!! I love the drippy goo punch on the inside. The ghost all shimmery is so fun, too. These little stamps for some reason make me think of Mario Brothers. I don't totally know why, but it makes me smile anyway! Oh, how cute, Kerri! I love hthis little Fhiona too! What a sweet ghost next to her! Love your idea with the inside! Kerri, what a fun card it is. Love the cute Fhiona. You did a great job coloring her and the border punch is a wonderful addition!